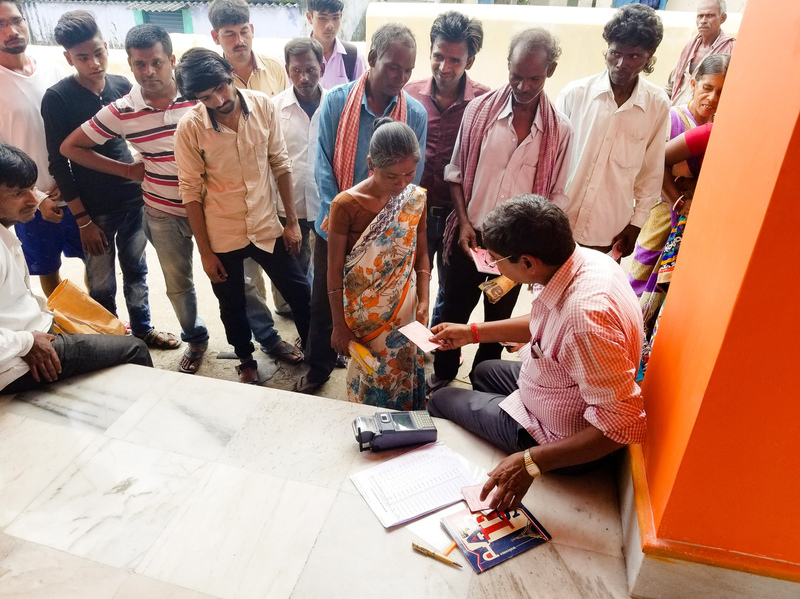 India's Biometric ID System Has Led To Starvation For Some Poor, Advocates Say The world's biggest biometric system, with iris scans of 1.2 billion people, was designed to help the poor. But it has sparked concerns about privacy and in some cases has exacerbated starvation. Ashok Kumar (foreground) works at a food ration distribution shop in Jharkhand. He uses a small machine to scan people's fingerprints and check them against Aadhaar ID numbers. To try to address these issues, the Indian government rolled out the biggest biometric ID system in the world. It's voluntary, but in just eight years, India has managed to collect the fingerprints, photos and iris scans of more than 1.2 billion people. The government says this system, called Aadhaar — "foundation" in Hindi — has helped to distribute welfare to the country's neediest; streamline the civil service; purge hundreds of thousands of names from voter rolls; and allow for people to move between states without losing benefits. But privacy advocates are alarmed that the government has collected so much personal data. And advocates for the poor say some technical glitches have actually led to denial of benefits — even costing lives. An Aadhaar enrollment worker scans applicants' irises, takes their fingerprints and photos, and assigns them a unique 12-digit number. The biometric data are stored on government servers. Several weeks later, an ID card arrives in the mail. The rollout was accompanied by a big patriotic PR campaign, with TV ads showing smiling elderly people using Aadhaar to collect state pensions and villagers using it to collect food rations. It was geared especially to India's poor. "In India, you're nothing without Aadhaar," says Manisha Kamble, 17, who is homeless. Kamble is from the Dalit community — formerly known as untouchables. She, her widowed mother and about 25 other street children sleep every night on the asphalt in a circle, under a highway overpass in Mumbai. She had no address and no birth certificate. She was basically invisible to the state, until the charity Save the Children helped her enroll in Aadhaar. It has helped her get into a decent school. She is looking forward to turning 18, when she can use her Aadhaar to register to vote. Kamble says she is proud to be counted, to become official, to feel equal to other Indian citizens, regardless of caste. "I want to study and make sure that there are no more Manishas like me, who have to struggle like I did — and I want to take care of my mom," she says. Kamble studies at night under streetlights and got the highest marks in her class last spring. Aadhaar can be used to verify your identity when you do anything involving the government — get married, pay taxes or draw welfare — and also when you open a bank account, sign up for a cellphone contract, or set up an e-wallet online. It's mandatory for some state health benefits. The system is designed to cut fraud — after all, it's hard to counterfeit your irises. But it requires electricity to scan people's biometrics, and Internet access to check them against government databases. You'll find those in India's big cities. In poorer places, you often don't. In Jharkhand, one of India's poorest states, Aadhaar is mandatory for food rations. A long line forms outside a tiny stucco booth, painted lavender, with a corrugated metal roof. It's a government food ration shop. Inside, the distributor scoops out rice, weighs it and delivers it to customers. More than half of Indians are eligible for free or subsidized food. In rural Jharkhand, the figure is 86 percent. The government says Aadhaar has helped eliminate nearly 30 million fake or duplicate food ration cards. Ashok Kumar distributes government food rations to customer Leela Devi at his shop near Ramgarh, in India's Jharkhand state. At this ration shop, Ashok Kumar, 57, scans people's fingerprints with something that looks like a credit card machine. It runs on batteries and needs a 3G or 4G cellphone signal. But the network is shaky. Kumar walks across the street, lifting his machine up overhead, until he finally gets a signal. He sets up shop instead on the steps of a Hindu temple. One by one, he types people's Aadhaar numbers into the machine and then asks them to place their fingers on a small scanner. The machine checks their numbers against biometric data on government servers and prints out a receipt for food rations — bags of rice. But one customer isn't so lucky. 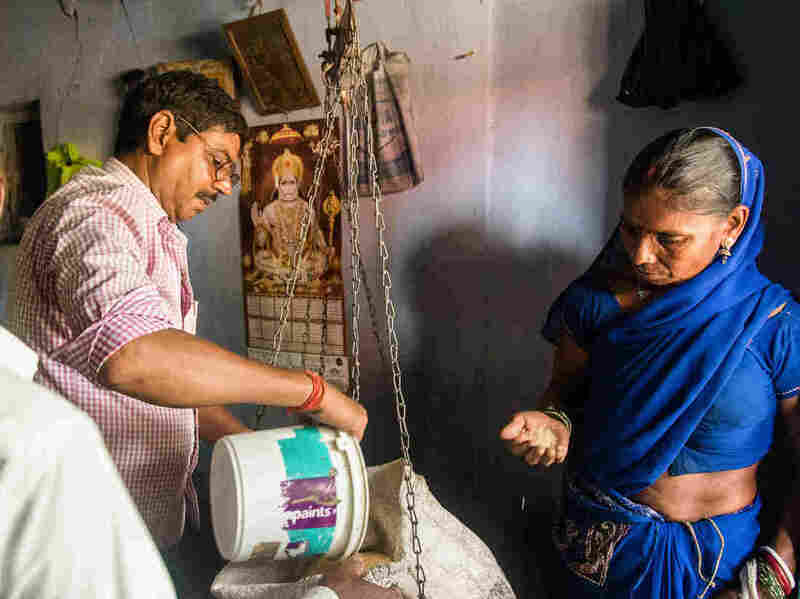 Karu Bhuiya, 48, has done manual labor all his life. His fingertips are worn. Kumar tries to scan them five times, but gets an error message. The machine here is rudimentary, and only scans fingerprints — not irises. So Bhuiya is turned away. He goes home without food. Technical difficulties like this are blamed for pushing some of India's poorest into starvation. Jean Dreze, a Belgian-born economist who lives in Jharkhand, says he has counted a dozen such deaths in recent months. He provided NPR with a detailed list of their names and circumstances surrounding their deaths. 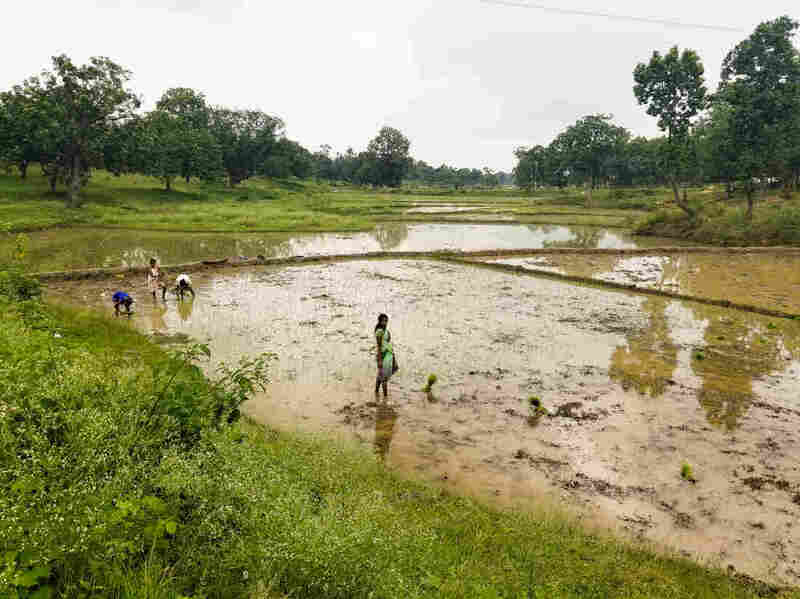 Women harvest rice in rural Jharkhand, one of India's poorest states, where at least a dozen people have died from starvation amid glitches in welfare distribution. "I would actually prefer to call these destitution deaths, because they're all cases of people who went hungry for days, who would have survived if they had had some resources," Dreze says. "See, this is the unfortunate thing: that the most vulnerable people are those who are also more likely to be excluded by this system." When Aadhaar scanners break down, there's supposed to be a backup system on paper. But at the ration shop NPR visited, near the town of Ramgarh, the paper log was blank — unused. "Nobody should be denied benefits — either for lack of Aadhaar, or for lack of authentication," says Nandan Nilekani, the key architect of the nation's Aadhaar system. "There have been some challenges, but that doesn't take away from the enormous benefit of empowerment, mobility and savings this project has given India." Nilekani is the former CEO of Infosys, a big Indian IT and consulting company. He is a tech billionaire who left the private sector to create Aadhaar for the Indian government. In an interview in May, Nilekani told NPR that the benefits of Aadhaar far outweigh any glitches. "Our whole goal is to give people control. They should be able to get their digital footprint from their smartphone, from their payments, from whatever," Nilekani said. "I'm using my own data to make my life better. That's a fundamental inversion of how you think about data." Nilekani is from Bangalore, India's version of Silicon Valley. His critics question whether a private sector "move fast and break things" approach is appropriate for a government program like Aadhaar. They argue the fundamental job of government is different — to protect the most vulnerable citizens, rather than race to be the most high-tech. That debate was underway when suddenly reports of data breaches began. In January, investigative journalist Rachna Khaira discovered that the laptops of some Aadhaar enrollment workers — those who scan irises and take fingerprints — had been hacked. Khaira managed to buy access to up to 1 billion people's Aadhaar data — for less than $7. After her report, the government agency behind Aadhaar, the Unique Identification Authority of India, took legal action against Khaira, accusing her of cybercrime. "I am not against Aadhaar," Khaira says. "My only concern was this: that if we implement this project, it should be foolproof. We should not be scared. We should not be feeling jittery about giving out our Aadhaar numbers." Keeping people's Aadhaar data secure is not just a job for the Indian government, though. One of the ways it managed to enroll so many people was by partnering with banks, utilities and cellphone providers, many of which require Aadhaar. So now people's data reside with all those companies as well. It's impossible to know how many data breaches have occurred. In India, the newspapers carry reports of them almost daily. "When it comes to Aadhaar, it's the Wild West out there in India. Millions and millions of people have been compromised by the process," says Nikhil Pahwa, a privacy activist and founder of the digital news site MediaNama. "I see this as a major national security risk." Edward Snowden, the NSA leaker, has also criticized Aadhaar, calling it a mass surveillance system that will lead to "civil death" for Indians. Data privacy advocates have taken their concerns all the way to India's Supreme Court. Last year, the court ruled that privacy is a fundamental right. Then last week, it ruled that private companies can no longer ask for people's Aadhaar data. It also said schools can no longer require biometrics for admission. But the information is already out there, being used by marketing companies — and possibly by political parties. In August, the Unique Identification Authority of India introduced new directives to enhance security, including two-factor identification using facial recognition. A small number of residents of India, including the economist Dreze, have nevertheless refused to enroll in Aadhaar. In India, though, data privacy is still mostly a concern of the educated, urban class. People in the food ration line may not be as worried about their digital footprint. They have more dire concerns. 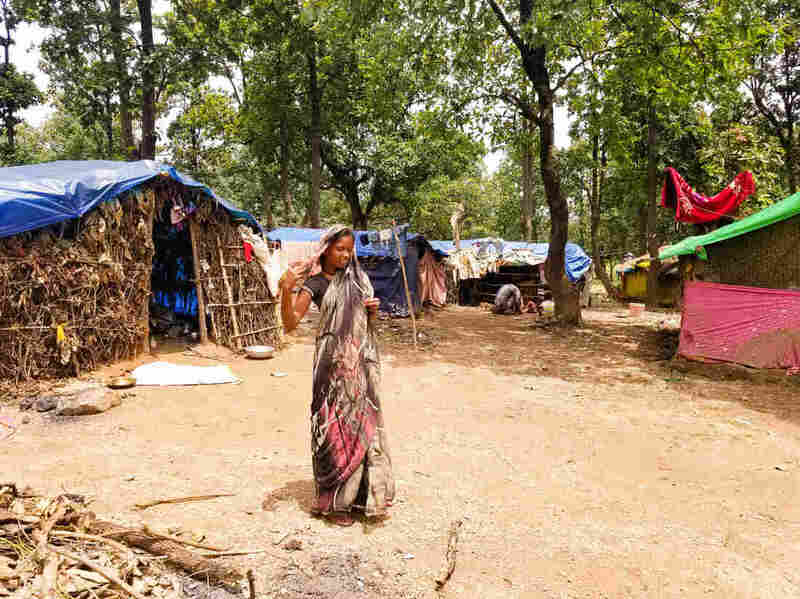 Not far from the ration shop NPR visited in rural Jharkhand, migrant workers huddle in sagging thatch huts covered with blue tarps, during the monsoon rains. They are members of India's tribal Adivasi community, who are among the country's poorest citizens. They often migrate between states, with no fixed addresses. In June, one of the men in their community, Chintaman Malhar, died at age 50. Relatives say he hadn't eaten in days. Based on his field work, Dreze, the economist, concluded that Malhar had lived in a "state of semi-starvation." Nisha Devi lives in a rudimentary hut covered with a tarp near Ramgarh, in India's Jharkhand state. She believes hunger led to her uncle's recent death before he could get an Aadhaar card. The rest of the family has scrambled to enroll since his death, but Devi has been unable to draw welfare benefits so far. Malhar died before he could get an Aadhaar card. After his death, his relatives and neighbors all rushed to try to enroll. "A local official came and advised us all to enroll in Aadhaar," says Malhar's niece, Nisha Devi, cradling her toddler. "He told us it would help us get residency, and finally have an official address, and get benefits." She believes hunger killed her uncle, and she wants to avoid a similar fate. Devi hasn't yet been able to collect any food rations. She is still mired in bureaucracy. But she hopes that Aadhaar — perhaps the world's most sophisticated biometric system — might one day help her.